As humans, we believe that what we can’t see, can’t hurt us. We are wrong. What we can’t see, can sometimes be the deadliest. This is especially true when it comes to medical conditions and diseases. For years, doctors have been referring to high blood pressure as the “silent killer.” The condition impacting one in every three American adults often has no warnings signs or symptoms. This can lead to it going undetected until significant circulatory system damage has occurred. 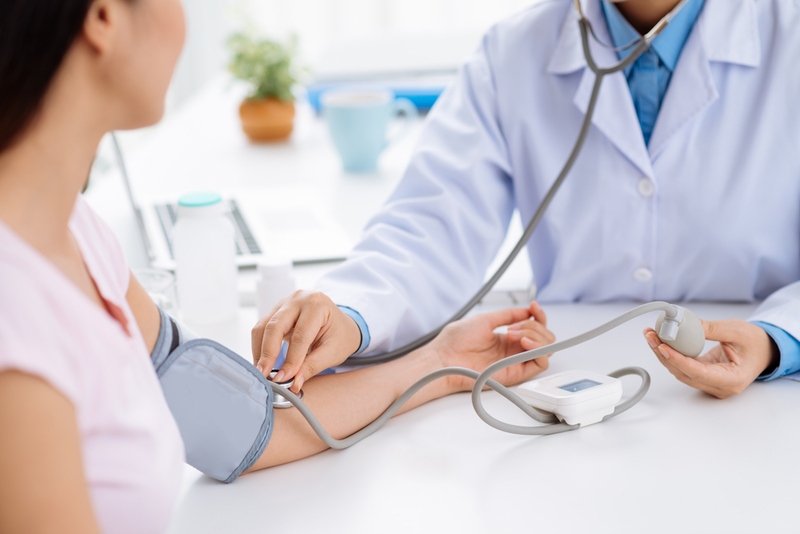 While getting your blood pressure frequently checked is the only way to catch high blood pressure, educating yourself on the condition is important for learning about treatment and prevention options. Blood pressure is the force of blood pushing against your blood vessel walls. It is measured by two numbers – systolic and diastolic pressure. When looking at your blood pressure using a monitor, your systolic pressure is the top number, showing the amount of pressure in your arteries when your heart beats. Your diastolic pressure is the bottom number showing the amount of pressure in your arteries when your heart is resting. The American College of Cardiology states that a normal/optimal blood pressure is below 130/80 mm Hg. When someone has high blood pressure it means there is too much pressure in their arteries. This is indicated by a blood pressure reading with the systolic pressure between or higher than 130-139 or a diastolic reading between or higher than 80-89. When someone’s blood pressure reaches this level, a doctor will often prescribe lifestyle changes or a blood pressure medication. What are the long-term complications of uncontrolled high blood pressure? High blood pressure damages your blood vessels and heart over years to decades. However, this does not mean you should put off getting your blood pressure checked. If left undetected, there will be too much pressure in the arteries, resulting in the heart working extra hard to pump blood throughout your body. And, when the heart consistently works too hard, heart failure, heart attack, stroke and kidney disease can occur. These things can often be prevented by catching high blood pressure early. What causes high blood pressure and who’s at the most risk? 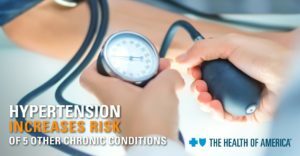 While there is no one identified cause that guarantees high blood pressure, there are several risk factors that increase one’s likelihood of developing the condition. Age: As people age, they’re more likely to have high blood pressure due to blood vessels losing their elasticity. Being obese and overweight: Individuals who are overweight have more fatty tissue to circulate blood to, which puts an additional strain on the heart and cardiovascular system. This can cause health complications including high blood pressure. Lack of physical exercise: When people are physically active it lowers their overall blood pressure. A sedentary lifestyle increases your blood pressure and puts you more at risk for developing high blood pressure. An unhealthy diet: Eating too much salt, saturated fats, trans fats and sugar increases one’s chance of developing high blood pressure. However, eating a healthy diet of nutritious foods can lower your blood pressure. Smoking and tobacco use: Smoking damages arteries and causes blood vessels to narrow, this makes the heart work harder, increasing one’s blood pressure. Mental stress: While occasional stress does not raise pressure, chronic and continuous stress can. This kind of stress can elevate blood pressure levels and can lead to additional health conditions like depression and diabetes. 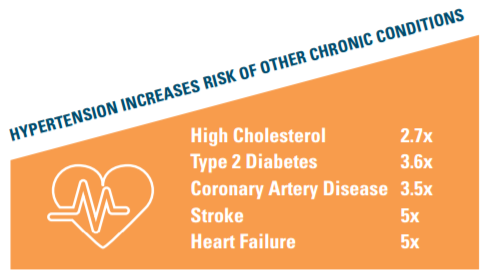 If you or someone you know is susceptible to any of the above risk factors, consult your doctor or physician to begin discussing high blood pressure prevention measures. How is high blood pressure treated and can it be cured? Unfortunately, high blood pressure cannot be cured. It can be treated through proper management and sometimes medication. Altering your lifestyle is the first steps towards managing high blood pressure. Common lifestyle changes include eating a well-balanced diet lower in salt, exercising 30 minutes every day, maintaining a healthy weight, cutting out smoking, reducing stress and taking medications properly. Working with your doctor or physician to create your unique lifestyle plan is the best way to get your blood pressure on track. For more information on high blood pressure, talk to your doctor or physician at your next appointment or check out the American Heart Association’s high blood pressure resources.